Western Carolina University began as Cullowhee Academy, a primary-level subscription school for boys and girls established in 1888 in Jackson County. When the academy's first teacher left after one year, community leaders hired a young Virginian, Robert Lee Madison, as principal. It was Madison who proposed what he called the "Cullowhee Idea": that the state appropriate $3,000 annually to an existing high school in each congressional district to support a normal department to train rural teachers. The legislature instead gave Madison $1,500 for a normal department at Cullowhee alone. In 1901 the school received its first capital improvement money from the state, and four years later the legislature changed the name to Cullowhee Normal and Industrial School. It became the model for the creation of Appalachian Training School for Teachers in Boone in 1903 and East Carolina Teachers Training School in Greenville in 1907. Cullowhee, like Appalachian Training School, was essentially a high school with a teacher training program, though by 1913 both schools had begun the transition to junior college status. In 1925 Cullowhee changed its name to Cullowhee State Normal School (CSNS) and began a four-year evolution that transferred the high school to the county and implemented a four-year college program granting the bachelor of science degree in education. In 1929 CSNS was granted a new charter by the state and renamed Western Carolina Teachers College (WCTC). The new degree program and a popular summer school changed the composition of the student body by attracting students from across the state. In 1942 WCTC began to offer graduate courses in education in its summer program in cooperation with the University of North Carolina and introduced a pioneering program in guidance and counseling. In 1953 the school's name was changed yet again, this time to Western Carolina College. It became the first of North Carolina's white state-supported colleges to admit an African American student when Levern Hamlin attended summer school in 1957. In 1967 Western Carolina College became Western Carolina University and was designated a regional university. It became part of the University of North Carolina System in 1972. Western Carolina University has continued to emphasize quality teaching, high academic standards, faculty-student research, and the assessment of student learning. The founding of the Faculty Center for Excellence in Teaching and Learning and the North Carolina Center for the Advancement of Teaching symbolize these efforts. In 1997 Western Carolina University became the first institution in the UNC System to require students to own computers. In the early 2000s the university had a total enrollment of just over 7,000 students. The 265-acre campus includes Hunter Library, the largest collection in western North Carolina, and 5,700 computer data ports on campus in residence hall rooms, electronic classrooms, and laboratories. William Earnest Bird, The History of Western Carolina College: The Progress of an Idea (1963). Curtis W. Wood and H. Tyler Blethen, A Mountain Heritage: The Illustrated History of Western Carolina University (1989). NC Highway Historical Marker Q-38: http://www.ncmarkers.com/Markers.aspx?MarkerId=Q-38 (accessed February 23, 2015). 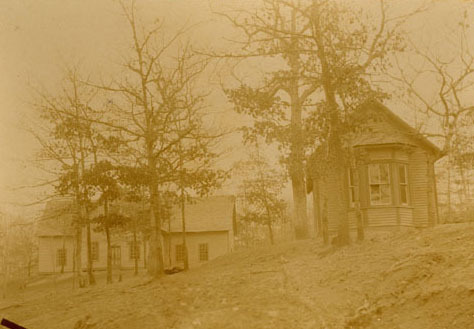 "The first two school buildings of Cullowhee High School, about 1891. The building on the left is the first schoolhouse. On the right is the Music and Art Building." Image courtesy of Western Carolina Library Digital Collections. Available from http://www.wcu.edu/library/DigitalCollections/EducationWNC/cnis/index.htm (accessed November 19, 2012). Western Carolina University. Image courtesy of Digital NC. Available from http://digitalnc.org/blog/western-carolina-university-yearbooks-now-available-online (accessed November 19, 2012). 1 January 2006 | Wood, Curtis W.